So the work on my wee beastie has begun. Got all the pieces I could find put back onto the car. Replaced the battery. Cleaned corrosion from the cables using some liquid spray thingy from the oil cupboard. Probably Penetrating Oil LOL. Didn't have any carb cleaner or battery cleaner handy. The corrosion colony on the positive terminal was advanced enough to apply for citizenship. Marveled at the female 110 outlet stowed in the battery compartment. Female. As in, the thing you plug your equipment into. Does this thing have an inverter on it? Looks like a factory thing (??). Unlike the other wiring added on the other side of the battery compartment which looks like a reasonably-well done custom mod. Figured out how to mate the key back to the car (sort of; it seems I have to repeat the procedure every day. That will get old quickly, but sort of acts like an additional anti-theft device, so maybe I can convince myself it's a good thing). Yes. She started. Sitting 4 years with diesel at 3/4 tank, and she started. She didn't run long. She bubbled and glurbled and stumbled and sputtered and stuttered. A few seconds in a belt started to whine; a short while later she surrendered and stalled. No start since; occasional single-pop ignition, not enough to get her going. Two wrenches on console; presumably oil change indicator or the rough equivalent of a check engine light? OBD-II indicates two codes; I can't figure out how to get my reader to show me the second one. Seriously. Programming and using computers since age 14 and I can't find a "Next" button or an arrow key that behaves in an expected manner. Darn kids and their toys. Get off my lawn. Throws P0087 (Fuel Rail/System Presssure Too Low). Presume bad fuel and/or clogged fuel filter. Certainly these need doing anyway, along with the oil and its filter. Speaking of filters, the air filter is half the size of the engine. My friends will no doubt soon tire of my SmartCar stories. I don't care. Found the radio code hand-written in the warranty booklet; unlocked the radio and programmed in four stations to the four buttons.However, Button 1 is also "Scan", so when I press 1 now I get the station I asked for... briefly. LOL Haven't figured out how to get past that. An owner's manual might be helpful. Went looking for owner's manual online. Lots of links teasing me, dangling a purported owner's manual on the other end; but, alas, even including the links from this site; only one downloads a PDF, and my PDF reader can't open it (???). So I'm flying blinder than usual until I can resolve that issue. Yes, computer geek can't find or open a PDF file. Maybe I should retire and garden for a living or something. There's a very nicely done on/off switch which upon closer inspection appears to be mod work; bottom of console/dash, driver's side, near center. It also, upon closer inspection, appears to be popped out of its socket. But it looked nice until that happened. Right side has what appears to be a control knob for... an extra air conditioner? It has a snowflake on it. Can't wait to find out what that's all about, if it works, etc. Filled all the tires back to one pound shy of the indicated pressure (51 PSI; pushed hand compressor to 51 with a one-pound drop after compressor stops). If nothing else I figure it will make it easier to push her around while I wait patiently; oh, so patiently, to get her started. After exuberantly announcing to my wife that she started, ran briefly, and then died, with graphic descriptions and lots of hand motioning, her response was: "You smell like diesel." I have a great support structure over here. Me, Myself, and I (thank goodness for the fourth member of the cheering squad: Ego). 3 x 5-gallon Yellow Diesel Fuel Containers (Tank is 3/4 full, holds 33L (8.7 gallons?) so probably has 5.85 gallons in it. 2 Cans for extracted fuel; 1 Can for new fuel. Doubles as serious emergency extra supply for long trips into the Grand Canyon or something. Or if I apply the Forsea refit kit, maybe I could use it to get to Hawaii or something. Jack (model to be determined). Can jury rig something out of paper clips and rubber bands until then. Trying to use brick-n-mortar stores, but some of this stuff is coming from Amazon. On the week several hurricanes come a-calling. Yes, I have a wonderful sense of timing. I'm sure delivery times will be juuuuuuust fiiiiiiiine. Remove Oil (don't forget to jack Front Left so we get it all). Add new Oil, 2.7L exactly, not 3.0L. Also, I need to find out if there's a way to prime the injectors. Haven't found anything on this yet. Will post separate question for that. The plug by the battery is factory for fitting a battery blanket, there should be a cord to fit the round plug left side of lower grille. The Canadian cars came with a disabled you will have to hit the unlock on the remote every time you start the car after it has been off for a few minutes. Does yours have the drawer under one of the front seats the owners manual may be there? Be careful on the fuel filter the Canadian cars use a different one than the European models and the location is different also. Belt whine is probably seized alternator from sitting. Do a search here very common problem lots of advice on how to fix. Most cars won’t crank fast enough to start when the alternator is seized. I'd read about the alternator freeze-up, and initially guessed that was the source of the belt whine. However, since she had actually started, I talked myself out of that, figuring that the motor would have busted that free. I'll re-read how to unstick the alternator. Maybe this will give me my first "take off the right rear tire" story? I'm sure my friends will be thrilled LOL. Thanks for the tips! Forgot to look for the drawer, will do so. for the radio, predicted the TP button until it's off the LC screen. That will make the station stay where it's set to. two wrenches: major service due, or due soon, depending on what number accompanies it. switch at centre of lower console is interior light and switch. An owner's manual might be helpful. 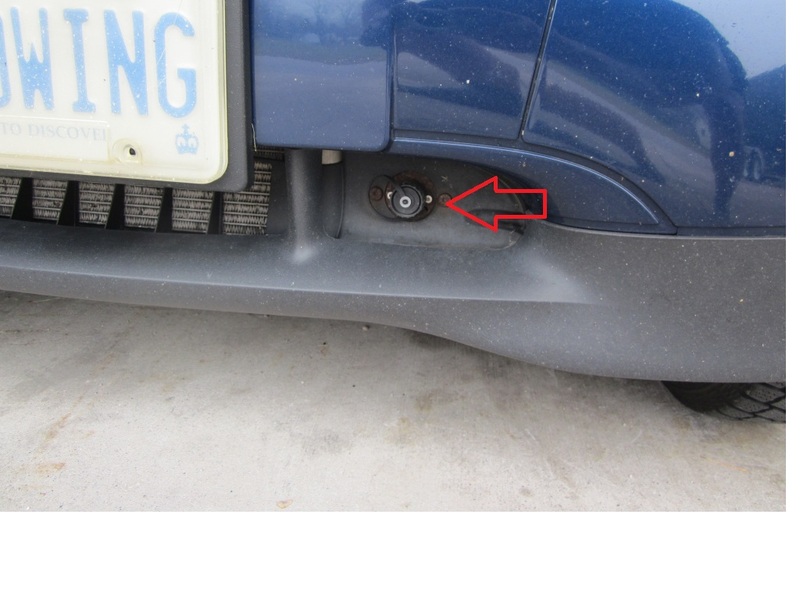 When plugging into the weird little plug on the driver's side front (lower air intake area .. see second photo) it also sends 110V power to the female plug near the battery. This can be used to connect an aftermarket battery warmer or electric in-car heater. 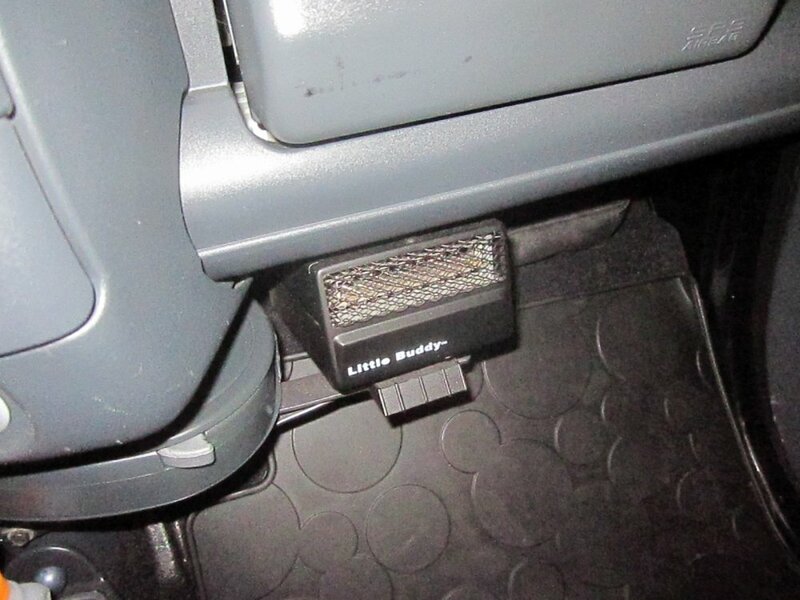 See first photo for in-car heater in my car. Two wrenches indicates a more extensive service needed as Mike T mentioned above. This means wheel removal and checking brake measurements for wear. Also battery levels and condition. Many other things as well which a competent mechanic should check. A single wrench indicates oil and filter change. Try an on-line search of local and non-local wreckers (auto recyclers) for a manual. You may get lucky. Also as mentioned above, snowflake = Air conditioner. I can't see 51 psi as being a proper tire pressure for the smart. Way too high! Smarts also come with a compressor that has a pressure gauge inline. Personally, I use a small bottle jack. It doesn't take up much room and works well. Thanks to all for the tips and info. Thanks to the UK owner's manual noted above, I see I have the Smart Radio Five. I'll get pictures up eventually. Found some more oddities and would like opinions and thoughts. Not tonight. Hatch struts are shot. I saw a note that someone picked them up from dealer at $63 each (presumably $63 CDN). Guess I'll keep using the broomstick until I can prove the vehicle is roadworthy. Got in to the Mercedes-Benz dealer, the only way they could look up the part was by VIN. Wow. Luckily, I was able to find my update on the VIN database by searching for my town name (Parma) and had the VIN available. One oil filter ordered; shipping from Germany will take about a week. They also informed me that VIN was insufficient to isolate fuel fitler type so he recommended I take it off and bring it in. I'll take the fuel filter off and investigate, but I'm not sure I'll need to take it in. [Nigel] says Mann HU68x so I'm betting that will match. We'll see. VIN is now in my online document repository. Started clearing stuff out of the back section; Discovered a car cover and a coil spring (??) in the back section. Guess I'll be investigating the suspension. I buttoned her up and rolled her back into her parking space. The HU68X is an oil filter.. Rock Auto has the fuel filter their number is DF 6305. They also carry the oil filters.. There may be a tire pressure sticker in the passenger door jam. I believe it says 29 front and rear but I run a couple more when I remember to check mine. Tire pressure 26-30 all around I find good enough, flat even works in the rear if you have to...lol. Sign in and donate the lowest amount or better at Evilution.uk.co or something like that, it is by far the best technical site i have found so far, not overly chatty by any means, like none, so us chatty types will be very sad there...but full of useful information! Good luck finding that external extension cord that fits the front stock plug in......IF you do not own one, simply swap it out for household version......plus you won't leave the front of your car in the driveway if you forget to unscrew it during the best time to work on your car...lol. I'd strongly suggest doing the rebuilding of the altenater and starter before winter if you haven't started the vehicle for a long time....from the horror stories I see all the time about siezed items and how difficult it is to get them off engine ......especially in a cold environment! Mine will be done after the lift is in. I installed a spare fuse panel near the battery and used a switched power to a relay to power it straight from the battery, just so I didn't have to get computer reflashed if i wanted to add electrical items to the car and it didn't like what I have done. Harborfrieght I'm sure you are aware of, it's Princess Auto up here in Canada. Oh, clean out your EGR valve now before you get into again the cold weather.....it'll be plugged up I bet! Maybe even think of disabling it in one of the two ways we can. I took mine completely off and made an emulator. Really easy and never any EGR issues ever again. Check intercooler rad for rub through in the front facing side of the tubes. It can be fixed using JBWeld or buy new....I used the weld...lol. Must be surgical clean to work,. Use a multi meter to check to see if your glow plugs are good and if not replace but beware they may not want to come out. I got 2 out of 3 of mine out.....luckily one was the bad one...lol. The last one was dangerously close to snapping so I decided to takle it another day...maybe? Take out the rear corner windows, they have a little clip in the front lower corner that needs to be uncliped then the inner hold down ring pops out, then the window will pop out...it'll be leaking I bet. Another thing you will want fioxed before the colder weather. I simply got me some clear silicon, it won't leak anymore! But you can hear it flexing in the summer serious heat days...lol. But it's not leaking! IF it leaks the floor will fill up with water and rot the carpeting and floor boards! Not to mention destroy that little silver box next to your battery. That also is another item to check into.......open it up and check the lower PC board for the white fuzzies....well known issue so I'm told. You'll love the little beasty once you get her going well.....for me up here getting raped for diesel by the government at $1.23 per litre I can normally get $20 in the tank to do 400kms.....so god only knows what a tank of fuel will cost you below the border.....and I'm getting close to 80MPGs! Regularly! Have I had enough? LOL. What is this "enough" of which you speak? I was hoping to not have to dig too deeply into it, and that the only real problem was with the transmission, as described by the previous owner. The owner(s) before him put a lot of miles on this thing, and seem to have taken the time to do some work on it (custom A/C addition, for example). So I'm hopeful that the only real issues I have are that it sat a long time and the previous owner never found the time to fix the transmission issue (he wanted to order a new one from Germany and pay to have it shipped over. I chatted with a gent who had an ad out someplace looking to buy old Smarts and he highlighted the cable split fork issue. But we'll see. I'll invest in getting her running until she's running or I surrender. My wife is already fawning over how cute they are; I can see us winding up with two of these. The good news is it looks like two of them will fit front to back in one of the car slots of our garage. Lifting a Smart -- cool idea. But lifting, like with Jeeps, has a price on stress angles and such. Does the Smart natively come with U-Joints or CV Joints? CV joints...lol. But, it's not like we are going into orbit like we thought when dealing with jeeps...lol. All I'm after is a decent set of aggressive snow tires just to see if it's snow capable. I live next to the biggest lake in Ontario, lake Simcoe.....which people drive all over ice fishing ....one guy actually installed a track system in the rear to get further ...lol. I'll just conquor the streets.....I just want snow tires not wet weather tires they try and sell as snows...lol. They actually make a 2" lift kit but by the time it gets to my door it's far too expensive for what it is. Besides I can make most things myself with some inspirational ideas...lol. Far easier than taking the engine out i think...maybe? Plus it's forcing me to actually check the rest of the car.....which i had no intention of doing seeing as i bought it for parts! But it drives perfectly! So now i need a third car for actual parts...lol. they're breeding! Well, delayed. A business trip, unexpected repairs to another vehicle, and during my week of vacation I would up spending most of my time doing work from home because we got nailed by a huge RansomeWare attack. Winter is coming. LOL. I need to get to the point where I know if this wee beastie is going to run for the winter or not, and if it is, I need to get more deeply educated on, inspect for the presence of, and prepare to construct and install if necessary, the Tolsen Constrictor. I know delays are inevitable for any hobby. But this is also, hopefully, going to be my get-around car for the winter. It's a 45-55 minute drive; it would be nice to be comfortable. I'll likely eventually want to investigate the 2" lift if you have success with it, [Willys]. I'd like to know how it handles and if it modifies your consumption rate any. Well, my winter beater is basically ready for a run down the road now. Everything has been done that can be done to it to prepare it for the winter cold, snow and heat issues. Daystar I think is the maker of said lift kit but with exchange rates to Canada and duty I expect I chose to make the same kit. It wasn't a fast issue to do, but done for peanuts compared to cost of actual kit. All I'm missing are the larger tires and they will be bought after I get a weeks worth of driving on ket to see how it handles everything. I have read issues with bump steer etc but if you intend to drive it sensibly I see no problems seeing how it's designed, besides, they wouldn't be able to sell it if it created huge problems. I should have taken her out today, but did too much yesterday, which caused today a day in bed day....frig'in neck! The only difference is the belly pans at the front as they forced over the lowered front subframe.....I simply attached the rear and middle the same way as stock and then zip tied the front to the bottom of the front bumper about 8 times. Simple array of holes and stitched it together. Didn't need to ruin the belly pan at all in chase it needs to be put back to stock at a later date. The biggest issue was replacing all belly pan boltsand sch with nutserts and 1/4-20 bolts seeing as 75% of my orginals snapped from rust! I'll get back on the saddle tomorrow and take her out. and give a report on handling.